A gorgeous Infantino/Anderson cover marked the second appearance of Jay Garrick, the golden age Flash. Once again it was a thrill to get a glimpse of some of the comic characters who made up the Golden Age of comics. This time, rather than the villains being spotlighted, it was the heroes who were showcased. For the very first time I got to see the Golden Age Atom, Hawkman, Green Lantern, Dr. Midnight, Black Canary when the Golden Age Flash reminisces as he weighs coming out of retirement. He does so because of a danger posed to his Earth (Earth Two) from a comet crashing in their sun and causing the planet to be bathed in deadly radiation. The only thing that can save them is a meteorite that crashed in the Arizona desert and which absorbs the deadly radiation. Problem is, the meteorite has vanished and the only solution is for Jay to travel to Barry Allen’s Earth (Earth One) to grab the meteorite from their Arizona desert. 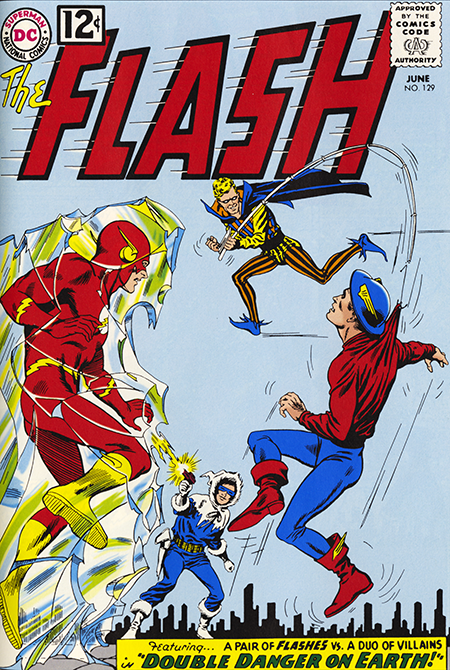 Thus the two Flashes are once again united, but, before they can snag the Earth One meteorite, they have to deal Captain Cold and the Trickster. The whole dustup makes for a great book length tale back when these longer form stories, as previously noted, were not the norm. In the end, Captain Cold and the trickster are defeated, the meteorite is used to save Earth Two, and a synthetic meteorite material is created to save Earth One when the comet crashes into our sun. The art by Infantino and Giella is especially sweet. I remember hardly being able wait to see what was in store for the next issue and it made the month long wait between issues seem even longer. To pass the the time and inspired by what I was seeing, I begin to work on some comics of my own.